The 8,8 cm Pak 43 Jagdtiger is a German tier 8 premium tank destroyer. In 1945, the production order for the Jagdtiger was increased, and the supply of compatible guns became insufficient. As a result, approximately 20 vehicles were equipped with the 8,8 cm PaK 43 L/71 gun. This Tank Destroyer is a formidable opponent on the battlefield as its main gun has excellent accuracy and an extremely high rate of fire for this tier (5.5 second reload). At long range situations, with the vulnerable glacis plate hidden and the robust superstructure exposed, this Tank Destroyer can become a nightmare for equal tiers to penetrate. 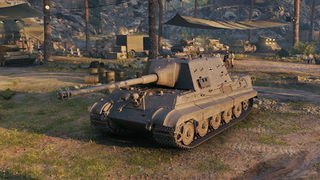 Its Tier IX Cousin the Jagdtiger has better mobility and firepower but this tank has a formidable rate of fire. Unfortunately you share the Jagdtiger's weaknesses too which is the vulnerable glacis plate and very weak side and rear armour. Keep at long range, avoid close combat, aim for the weakspots and you can be the deciding factor in the game. 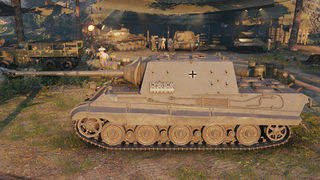 The Jagdtiger 88 was removed from the German Tech tree and in game store in patch 9.10, And returned in patch 9.22. Having a very armoured superstructure, an accurate gun with high rate of fire (RoF) and decent manoeuvrability, the Jagdtiger 88 is a deadly tank that can easily burn down many of the tanks with extreme damage per minute (DPM). Most shots from tanks you face will harmlessly bounce off your upper front plate and superstructure, but your sides are very weak and your turning ability is limited. With all these in mind, tactics with this tank should change over the course of the match. When the match begins, you should use your accurate gun to snipe the enemy, helping your flank thin out the enemies. Considering that most tanks of this tier have low rates of fire, your high ROF may provide the additional firepower necessary for your allied tanks to overwhelm the opposition. Be careful of areas with multiple shooting angles - your front may face an enemy, but your sides may face another flank! Alternatively one can engage in a frontal shoot-out, but take into account the terrain for locations where you can hide your (lower) hull and where the enemy has little to no chance of flanking you. The Jagdtiger 88 is unable to react to sudden changes on the battlefield due to lack of a turret, underwhelming HP/t ratio and slow hull-traverse speed. If your team is gaining the upper hand and the enemies' numbers are thinning out, you can start pushing your flank with support. Based on previous observations of enemy positions, angle your tank to ensure that all potential fire will hit your front or bounce off your sides. Attack enemy tanks to draw shots, which will expose them to your allies, allowing you and your team to swiftly dispose of them. If your flank is collapsing, pull back and use your high ROF to hold enemies off. Be sure to hide your lower front plate as it is very weak. Hopefully, more tanks will come to reinforce your flank, and your opponents will be weak enough to be easy pickings for your team. If such a flank is a short drive away, do not be afraid to go back and hold it - such occasions are where this tank shines, and a good defence can net 3000+ damage, several destroyed enemy top-dogs and a secured flank. Weakspot shooting is mandatory in this tank, as 212mm may not cut it on tier IX and some tier VIII opponents. Drivers of this tanks should get familiar with where to shoot on most opponents for damage. The accuracy and rate of fire will handle the rest. Reliably detracking enemies is also essential, as the gun fires faster than the speed at which a 100% crew with 100% repair can repair the track for most tanks. Not only can this save you from flankers, but it can also earn you "damage on detrack" bonuses on tanks that you cannot reliably penetrate from your side. At all times, be wary of other TDs. Most other Tier 8 and above TDs can either cut through your superstructure without much effort or de-track and nail you down helplessly, especially if you don't have cover. Your large size and slow speed make you an arty magnet, and with the potential for top tier SPGs in 8.6, this is an even worse issue. In addition, the lower glacis is very weak and should be hidden - hull-down tactics or a large rock may suffice to protect it. Tier 9 tanks, along with a few premium-spammers, can also easily crack your upper front plate and even your superstructure. If you find yourself in a battle tier 9 match, switch to a purely supportive role. 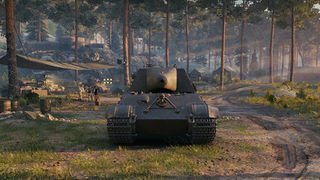 All in all, this tank has one of the best credit earning potentials of the tier 8 premiums. Use your gun to chip away at enemies, and you will earn a lot from driving this tank. As a point of reference, you can safely bounce up up to 175mm of penetration plus most penetration high-rolls even if your lower plate is visible. When you know that the opponent you are facing uses a weapon with such weak penetration you can deliberately expose yourself to the fullest and make a move on them assuming the conditions are right (no risk of shots being fired into your side, arty, etc). Of course there is always the option of the enemy using premium ammunition so it will remain a gamble. However if your opponent has AP loaded, he has no other choice but to use it or reload to premium ammunition. You can use that gap to facehug the enemy (especially when he is using a high calibre weapon with long reload such as 122mm D-25T on the IS) and deny him further shots into your lower plate. In November of 1944, Krupp proposed to arm Jagdtigers with longer 128mm Pak L/66 gun. The superstructure was be extended over the engine deck to allow for the recoil of the gun. The project was never realized.It was also intended to arm Jagdtiger with 88mm KwK 43 L/71 gun instead of 128mm Pak 44 L/55 gun.In April of 1945, four were armed with 88mm Pak 43 L/71 gun and were designated as Panzerjäger Tiger mit 88mm Pak 43/3 (Sf)Sd.Kfz.185, while those armed with 128mm Pak 44 L/55 were designated Sd.Kfz.186. This page was last modified on 17 November 2018, at 18:45. This page has been accessed 452,394 times.